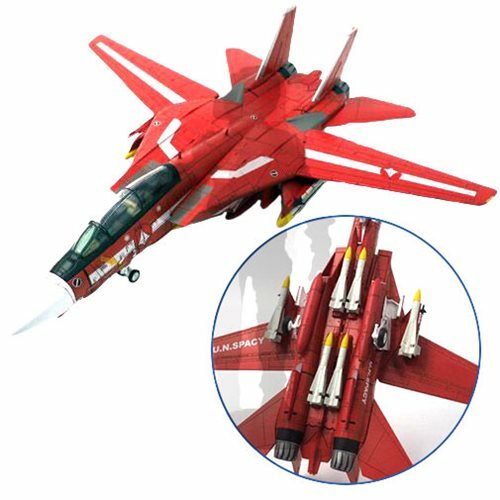 The aircraft F-14 Tomcat gets a Robotech upgrade! Calibre Wings introduces the 1:72 Scale F-14 UN Spacy Miriya Sterling's Die-Cast Metal Vehicle. This Northrop Gunman aircraft includes a pilot, geared swing wings, rubber landing wheels, opening cockpit, and detachable missiles and fuel tanks. Fans can will receive a collector's serialized card and a display stand along with the die-cast metal model. Measures about 10 1/2-inches long x 10 1/2-inches wide. Ages 14 and up.